...and now we all need to calm down a little. Here's Pablo Casals playing part of Bach's Cello Suite No.1 at Prades in 1954. There are still several places available for my workshop KICK-START YOUR WRITING this Saturday, 28 February. If you'd like to attend, please get in touch PDQ! Links et al are in the relevant bit of the sidebar! The next one will be in late March. UPDATE: It appears that Sundays may generally be preferred to Saturdays. If anyone would like to come along in March but would find Sunday 29th better than Saturday 28th, please let me know - this one is still movable! It's official, as reported by Slipped Disc, Opera Chic and Classical Music Magazine: Danielle de Niese is going to marry Gus Christie, hereditary head honcho of Glyndebourne and until a few days ago almost certainly the most eligible divorcee in Sussex. We are shedding a sentimental tear over this; they looked the picture of happiness last summer, draped over the picnic rugs together in what there was of the sunshine. Bless. And congratulations! MAD PROPS TO THE SUNDAY TIMES!! BLIMEY, guv! Bryan Appleyard has been picking the 100 best blogs for The Sunday Times and there is JDCMB, up there with the best o'th'best in the Performing Arts section! Mr Appleyard evidently has yet to discover the joys of Korngold, but what the hell - there's nothing so much fun in life as having a 'strange bias'. Thanks to my beloved Hungarians for alerting me to this with a congratulatory email. I hadn't read the ST today because I've spent most of the morning, er, blogging. About Russian pianists. A very happy JD is now looking forward to JDCMB'S 5TH BIRTHDAY coming up NEXT SUNDAY, 1 March. But I can't decide what to do to celebrate... Any ideas, folks? The other day I promised some less good news about another Russian pianist, and here it is: Grigory Sokolov, who was to have played at the Royal Festival Hall on 29 April, has cancelled his appearance due to visa trouble. The hoops that the British government is demanding artists jump through in order to perform here have now been set so high and made so unpleasant that it appears he has better things to do with his time than bother with them. He just won't come here. It's OUTRAGEOUS that such bureaucratic claptrap should keep one of the greatest pianists on the planet away from the musical capital of the world! And please don't start writing in to JDCMB with sanctimonious comments about keeping out terrorists - we've had plenty growing up right here in Blighty, and they tend not to be concert pianists, let alone ones of Sokolov's stature. Consolation prize: Sokolov is to be replaced by Angela Hewitt, who will perform the Bach Goldberg Variations. I'll be interviewing her on stage before the show. I've been wondering for a couple of days how best to describe Double Dream, the glorious evening of two-piano bedazzlement from the Russian classical virtuoso Mikhail Rudy and the jazz supremo from Ukraine/Norway Misha Alperin. The project started life about seven years ago and launched with a beautiful CD, which gives you the idea - take a range of classical works, pass them back and forth at high heat, watch them grow and transform like chemical crystals under waterglass. The concert caught on and the pair have travelled the world with it (most recently Sydney); now, after years of working together, they're at their peak both individually and as a duo. Each maintains his own identity, but together they are more than the sum of their parts. And Double Dream is more than just a concert. Kings Place was its ideal London home: it has the perfect acoustic of the Wigmore, the space, high-tech capabilities and delicious new-wood aroma of The Sage, the intimacy of, if not quite Ronnie Scotts, then almost. Double Dream is enhanced by creative lighting, opening in darkness (Schumann's Prophet Bird, its feathers in textures you've never encountered before), later blazing into floor-level red for a Prokofiev Toccata adaptation that could have had the startled composer on his feet, cheering, wondering why he hadn't thought of all that himself. Throughout, a giant screen is poised above the pianists, split in two - one half for each Misha - showing close-ups of hands or faces, Alperin's extraordinary plastic features morphing through vocal ad-libs as he plays and Rudy smiling quietly to himself, his partner and us. The pianists face each other across the Steinways, but the video reverses this: when the images meet in the middle of the screens, a peculiar creature appears apparently with one back, four feet and four very busy arms. Each pianist has a solo spot: Alperin improvised his way to a tremendous pitch of excitement that somehow drew in an unexpected extract of Rodeo, among other things; Rudy took Petroushka's fairground scene, one of his great party pieces, and, while playing it as written, managed to make it sound improvised. Many pieces are Alperin's own - catchy, irresistibly rhythmic, deliciously virtuoso. And in their far-flung net the pianists trap the shadows of a Chopin mazurka, fleeting moments of Janacek, the silvery gleam of a Haydn adagio. What playing. What creativity. What magic. On Thursday, the second night of his Piano Dialogues days at KP, Mikhail Rudy joined forces with the actor Peter Guinness, with whom he collaborated a couple of years ago for the British version of The Pianist, his play for actor and pianist based on Wladislaw Szpilman's memoirs. This time it was Janacek and Kafka: the latter's beautiful, quirky Letters to Milena, warm and touching and painful by turns, in which the author traces his love affair with his much younger, married translator. Kafka and Janacek, the two great and not very bouncy Czechs, never met, but proved a perfect match nonetheless, to the point that from time to time it was almost difficult to remember that it wasn't Janacek who wrote the letters (which half-suggest, like a slightly distorting mirror, Janacek's passion for Kamila Stosslova). Micha paired music and words with inspired sensitivity, grasping the subtlest shades of emotion to match and amplify in the most heart-wrenching moments of In the Mists, the Piano Sonata and extracts from On an Overgrown Path. Again, masterly and unforgettable. As a finishing touch, each evening the St Pancras Room hosted a screening of a new documentary about Micha, entitled Mikhail Rudy: Portrait of a Pianist, directed by Andy Sommer and narrated (English version) again by Peter Guinness. It's a moving and at times harrowing account of his journey from Soviet Russia to Western triumph and makes all too clear the immense personal cost of such a move - alienation from one's family, a reunion almost too late. Rudy and Guinness will be doing a two-week run of The Pianist in the Royal Exchange Theatre in Manchester in June. Meanwhile I am trying to learn as much as possible from their presentation so that we can attempt to make the Hungarian Dances event - similar in format, if not content - perhaps half as beautiful. Mourning today the passing of two of the great driving forces of Decca. Christopher Raeburn was a great-hearted and golden-eared individual with high musical ideals and an infallible instinct for talent-spotting and development. He was the best-known and best-loved of Decca's producers, having joined the label in 1954 and bouncing straight into the first-ever studio recording of the Ring Cycle. Jimmy Locke was the chief sound engineer and the brain behind the much-celebrated 'Decca sound' from 1963, a 'star among stars' as Valerie Solti says. Michael Haas has written an obituary of Christopher for Gramophone, quoting Angelika Kirchschlager's tribute: "When you listen to me, it’s not only with your ear, but even more with your soul, searching for perfection not only in intonation but in truth. There is no better example of knowledge, enthusiasm, respect and humanity in this world of music than you!" Norman Lebrecht is inviting further comment over at Slipped Disc, more are appearing at Gramophone, here and here, and I too would like to invite your memories, tributes and so forth in the comment boxes below, please. I got to know Christopher personally just a few years ago, but can think of few people in the business whose warm and open nature and absolute artistic integrity inspired so much affection so quickly. To lose both him and Jimmy within days, and barely a week after the 'realigning' or whatever it is of Decca itself hit the cyberwaves, seems not only tragic but also ironically symbolic...but I don't have to tell you that. You can see it clear as daylight without anyone uttering a word. UPDATE, 27 February: Here is an obituary of Christopher from The Independent. 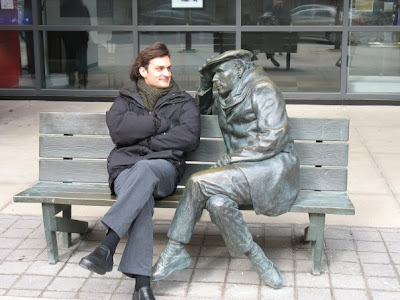 Over in Toronto, young Serbian-American-Francophile piano hotshot Ivan Ilic (nothing to do with Tolstoy) is making his Canadian debut tonight in a recital at the Glenn Gould Studio and took the opportunity to get a photo with a local celebrity. "Glenn and I were talking about his favourite coffee-shops and Indian restaurants in Toronto," Ivan explains. "He offered me a few prescription drugs, I tried (unsuccessfully) to convince him about Chopin..." He also gives a lecture-recital at the city's Alliance Francaise tomorrow. I much enjoyed his Debussy Preludes CD on the Paraty label, their order rather effectively (but very systematically) scrambled, which you can sample here. Look out for his London debut soon. Very successful pre-concert chat last night with Martin Helmchen at the QEH yesterday. Earnest, curly-haired, high-cheekboned, possessed of silky and radiant tone plus fine-tuned brain, Martin proceeded to navigate his way brilliantly through the complexities of the Bach Sixth Partita (the one with the very scary last movement that always leaves me thinking 'THAT is a GIGUE?! ')and three powerful extracts from Messiaen's Vingt Regards, towards which mighty complete cycle he's working his way steadily. But his style is made for Schubert. He's launched himself into the CD market with the big A major sonata, a disc that drew an out-and-out rave from BBC Music Mag. What a very pianoy week this seems to be. A morning chance to brush up your German and Dutch, from my next victim! ...seriously, this guy looks like becoming something very, very special. I will be doing a pre-concert talk with him at the Queen Elizabeth Hall tonight before his recital in the International Piano Series, where he'll be playing Bach, Messiaen and Schumann. His new recording of Schubert is the pick of the month in BBC Music Magazine. He's won the Clara Haskil Competition and has been a BBC New Generations Artist and one of the select fellowship-holders on the Borletti-Buitoni Trust scheme. And he's only 26. I will be foregoing the world premiere of Vladimir Martynov's new opera at the RFH tonight in order to hear him. Micha and Misha - Mikhail Rudy and Misha Alperin - hit Kings Place with Double Dream on Wednesday and Friday: classical Russian meets jazz supremo in a wonderful two-piano extravaganza, composed/improvised/inspired. The performances are part of Mikhail Rudy's 'curatorship' days at the hall entitled Piano Dialogues; on Thursday he is bringing together Janacek and Kafka in Letters to Milena, a musical and literary exchange of the type I adore, with narration from actor Peter Guinness. Each evening you can also see the brand new documentary about Micha, starting at 6pm, free. Regretfully, though, his planned late-night recitals are now not going to happen. I wonder whether this is because Kings Place, for all its excellence, is ideally supposed to help regenerate the seriously grotty bit of London that moulders away behind Kings Cross station. Good new venues should ideally be a great device to pull an area up, but this can take a very long time - it can be 20 years, or sometimes (as at the South Bank) 50. For the moment, there is nothing much at Kings Place except Kings Place itself and, though I am convinced the venue is the best thing to happen to London's musical life in decades, I could understand a classical audience not wanting to emerge into the murk after 11pm, when you tend to put your head down and leg it to the tube pdq. A pity, though, that we will not be hearing Micha play Scriabin. Meanwhile, here's a taste of Double Dream. Blimey, guv. George Benjamin's one-act opera Into the Little Hill ended up enjoying its London premiere yesterday in the spot the audience probably would have liked to be in all along: the bar. Ten minutes into the show in the ROH's Linbury Theatre, the lights went out, as Alan Rusbridger reports in the Grauniad. The power cut only affected the theatre, so everyone was offered free drinks in the bar while they tried to sort it, but eventually the doughty performers cut the Gordian Knot at 10.15pm and announced they'd do the performance right there instead. "The audience, which included the Arts Council chair, Dame Liz Forgan, and the former defence secretary, Michael Portillo, stood, sat, crouched and perched on the floor and assorted chairs for the 40-minute work," writes Mr R. There's a video on the site, here, so you can see the scene for yourself. ...when I found the Muppets and got distracted. Now for something completely different - after all, we can't have Valentine's Day 09 on JDCMB without some serious Gypsy violin playing! What follows is the real thing. When I give talks about Hungarian Dances, people often ask me if it's based on a true story or stories. The answer is: mostly no, but some of the stories have turned out to be true! Another FAQ is: would this be possible? That the grandparent could be a Gypsy violinist, then marry out of the Roma community and have a grandchild who'd become a classical musician? Here is a fabulous example of a grandfather and grandson who have gone down exactly that path. First here is the renowned 'primas' (violinist bandleader) Pali Pertis (Pertis Pali in Hungarian), serenading a very Valentiny scene with the actor Jávor Pál. Now, meet his grandson: the young Hungarian violin star Barnabas Kelemen, here performing a stunning Leclair duo with his wife, Katalin Kokas. Lots more information about Barnabas and examples of his playing on his website, here. It's extraordinary what a YouTube search on the words GYPSY VIOLIN will reveal. There are some joys to be had from the credit crunch/recession/slump/whatever after all. The Indy carries news that the original Muzak company is filing for bankruptcy protection. Does that mean we can have some peace and quiet again? I suspect not, of course, but we can dream. I've lost count of the number of musicians who tell me in interviews that piped music in lifts, lobbies and everywhere else they go is the bane of their lives. And I've always thought it's a form of universally administered anaesthetic: something to deaden our senses just enough to stop us getting too clever, noticing and potentially rebellious. I disagree profoundly with the Indy's leading article, though, which suggests that Muzak was the food of shopping and that music could now encourage us back to the shops. I promise you that there is nothing, but *nothing*, that will drive me out of a shop as fast as music I don't like. There aren't many shops that play music I do like, of course. Jigsaw seems to have a propensity for the ugliest kind of pop, which is just as well: I adore their clothes, so the noise saves me a fortune! The one piped music experience I remember with affection was one day in Monsoon when they played Abba and all the customers were singing along with 'Dancing Queen'. Most cheering. But I still didn't buy anything. Interesting to note, though, that genuine full-blown classical music pumped through underground, railway and bus stations clears away the yobs and hoodies like there's no tomorrow and makes the rest of us feel better about life. This will have to be short because my brain is so overloaded from last night. So, the news in brief. Mixed feelings about the production, which in certain ways is extremely striking - the stage-within-a-stage in the dream sequence, the stunning projections and shadowplays of the procession, the brief glimpse of Marietta's 1920s showgirl glory at the end of Act 1, and Paul's momentary hesitation on the threshold as he leaves at the very end. Never sure, though, about productions that show one thing while the text tells you something totally different - eg references to the beauty of Marietta's hair when she is walking around Paul's room with a shaven head. But the imagery is concentrated, the concepts focused and mainly appropriate and the walking houses are a super touch. I think the singers could have done with a break after Act 1 - the three-act version is a preferable format. But Nadja Michael, despite a little awkward intonation on high, does have the power, the presence and the legs for Marietta; Stephen Gould's voice is big enough to carry off Paul's massively demanding role, and when it's a case of standing and delivering he does so to the manner born; and Gerry Finlay stole the show with the Pierrot Tanzlied. Some concern in the extended first half that everyone was running out of steam, including Metzmacher, whose conducting often felt episodic, failing to shape and build the tension across the long spans; eg Paul's first aria describing his meeting with Marietta came over with little sense of its narrative structure, and that wasn't our tenor's doing but our conductor's. In the second half (well, the last third), second wind seemed to take hold: the procession and the Paul-Marietta scene alongside it were utterly electrifying. And there the full symbolism of the production, perhaps indeed the unconscious symbolism of the opera itself, came shining out: the war of the 19th versus the 20th century...the strictured, superstitious, hypocritical 19th, transfixed by an idealised and unrealistic past, when faced with the glamour, free spirit and sexual liberation of the 20th, is so threatened that it can only strangle it. And the terror that Paul may not represent only the 19th century, but the wilfully barbarian 21st. As for mourning... I still can't comprehend how Korngold could have created such a marvel of human empathy at the age of 20. He was only 23 at the time of the premiere in December 1920. Was it the air he breathed, Vienna in the First World War, the crumbling world, the death of childhood, the end of an era? Or did he just...know - and most of all, have the musical technique to reach directly into his audience's hearts when conveying that empathy? There was a great deal I didn't understand in the opera when I first studied its 'musical and dramatic structure' in 1987. Now perhaps I understand a little better. What I still don't understand is why I first gravitated to this, of all operas, in good times, student days, well before coming to terms with bereavement became such a dominant theme in my life (both my parents and my sister died within a few years of each other). Today is the 15th anniversary of my mother's death. "The end is not as abrupt as that. Your name is still spoken. Your face is still remembered. And what you said, and what you did, and what you failed to do, these are still remembered... As long as one is left who remembers you, so long is the matter unended...until you are quite forgotten...you will not be finished with the earth even though you are dead." 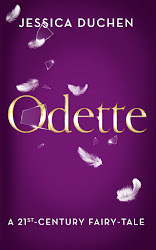 ...I am finally going to Die tote Stadt. It's not snowing, the trains are running (touch wood) and I hope to report back fully tomorrow morning! Watch this space. Glad to report that the Fiddles on Fire Festival - this year, two bonanzas of the hottest global violin playing from Klezmer to Karnatic, first in Gateshead, then in London - is to be the scene of some special Hungarian Dances: Concert of the Novel events in April! It was all their idea, too. When I went up to The Sage in September, I read from the book, then popped on a sneak preview of Hejre Kati from Philippe's CD. Collectively my audience shot towards the ceiling. The Sage being a wonderful, upbeat, go-ahead arts centre where managers actually speak to one another, someone then looked at my website, saw that there'd been a concert...and an invitation to go live followed soon afterwards. This is going to be very different from the Kensington event last summer - I have repointed the script to concentrate the action on the story of Mimi Racz. For Fiddles on Fire, we're creating a special programme of 75 minutes, to perform on the two Saturday evenings of the two festival wings, each at 6pm. 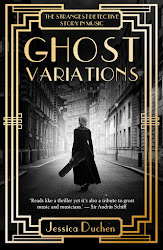 I've managed to reduce the 130,000-word novel to about 6 pages and with violin music including our beloved Dohnanyi and Bartok, plus Ravel, Debussy, Brahms and, of course, Monti and Hubay, we hope that you'll love the result. The Sage, Gateshead, event is on Saturday 11 April and I'm hugely grateful to Bradley Creswick, the leader of the Northern Sinfonia, for joining me in this since Philippe has a prior engagement on the other side of the planet. In short: the discs that become 'bestsellers' are almost certainly going to be those on which the most money is spent in terms of promotion. Promotion means that the public will know something exists (nobody will buy anything if they don't know it's there). The CDs will then bowl on up the chart, and will sell more. Or are we classical aficionados more independent-minded than crossover and pop flock-followers? What do you think, folks? You can't get any of this on BBC iPlayer, but the documentary, Alfred Brendel: Man and Mask, is snug on Youtube, so here is some of it. Still, no point waxing nostalgic. Lots of firms are going to the wall, taking their traditions to oblivion. Decca joins a long queue at the morgue. The regret is that what dies with Decca is more than just a label – it is the very concept of label as a mark of character, a name that united artists and listeners in the search for a particular quality. The idea of label defined the record industry. It is the strategic antithesis of sterile agglomerates like Universal. Without labels, artists spin off to Starbucks, listeners lose interest and the remnants of the record business go rummaging in dumpbins. Even a number-one classical hit barely shifts 500 copies a week, not enough to support an executive’s pension fund. It’s the end of the line for Decca, the last waltz in a bare-walled studio of dreams." So, where are the Raeburns and Haases of today? Christopher has retired; Michael divides his time between curating exhibitions in Vienna and producing Opera Rara's discs. If there are any brilliant people left in the recording industry, they are having trouble making their presence felt because the core values are vanishing from the big companies. For instance, in his article Norman complains about the "all-purpose" engineering of Julia Fischer's latest disc on Decca, which he feels does her no favours. Sound quality does matter to the record-downloading public, but what if a company boss does not know that, can't hear the difference and doesn't see the point of spending money on it? Here in the hackworld, we knew something was going wrong about 20 years ago when a major label (not Decca) held a press conference that included a speech by their new marketing chap, who'd just joined them from a food company and started declaring to a roomful of the most knowledgeable critics in the British capital how amazed he was to learn that Tchaikovsky was gay, so now they were going to develop a 'Tchaikovsky concept' in which... well, if the 'concept' ever took wing, it was quickly buried; but generally speaking the vision began to leave the industry when it chose people whose presumably considerable expertise in accountacy, sales and marketing nevertheless did not extend to a profound empathy with classical music and its market. I am no marketing guru, but it looks like a no-brainer to me: how can you sell anything successfully if you haven't a clue what it's about? There is an actual documentary about Alfred Brendel on BBC2 tonight, at 11.20pm (not exactly prime-time but we can always set the video if we can work out how to use it). 'Alfred Brendel: Man and Mask' follows the great pianist through two years, during which he works with such artists as Simon Rattle and Matthias Goerne, and explores the influences that shaped his life and musicianship. He's also featured in The Culture Show at 10pm - which has extra culture on it today, including our beloved Felix and his birthday. Here, apparently Brendel reveals a fondness for the films of Bunuel. I don't know yet whether the documentary will be available on the BBC iPlayer after tonight, but if it is then I will link to it here. It's Mendelssohn day! Over at BBCR3 Felixcitations I have borrowed the JDCMB Cyberposhplace and the Virtualvintagechampers and Felix is holding a party, which the virtualcybercontrollers are providing free of charge on condition that we are allowed to see his trans-spiritual-dimensional guest-list in advance. UPDATE: The post is now up, and open for suggestions of who else he could ask. Drop in for some cyberbubble! Meanwhile, here are three musicians who should definitely be there: Arthur Rubinstein, Gregor Piatigorsky and Jascha Heifetz. Turn up the sound now and wallow in their glorious playing of the first movement of the D minor piano trio. This is our street today. Apparently this is the heaviest snow in these parts for 19 years. You know, dear readers, where I'm meant to be this evening. 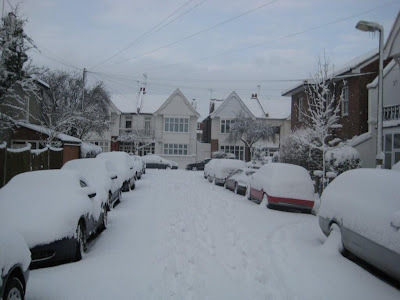 And you know, too, that it only takes a fraction of this amount of snow to stop all transport in the UK. More precipitation is forecast for this afternoon. Hmm. UPDATE, 1.50pm: TONIGHT'S PERFORMANCE HAS BEEN CANCELLED. All we have in place of Die tote Stadt is, er, a very dead city. UPDATE, THURSDAY MORNING: I will now be attending the DTS performance next Wednesday, 11 February. Weather permitting. 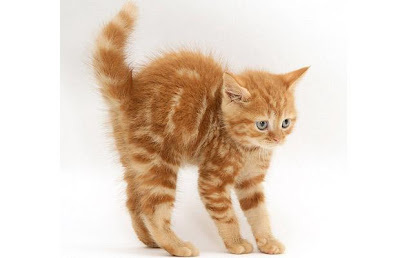 Pictures by Jane Burton of unutterably adorable cats, from the Telegraph website. Good light relief for the weekend. Some of us need it.